There’s nary an original bone inside the mechanized body of “Pacific Rim,” but it’s an expertly crafted spectacle that despite the familiar conceits delivers a satisfying visual and sonic experience. And not much more. If this is a film you’re even remotely interested in seeing you know what you’re in for – giant robots pounding on giant monsters amid an apocalyptic framework. We’re thrown into this near-future world head on with a neatly presented opening voiceover explaining how a rift opened deep in the Pacific Ocean, transporting alien creatures from another dimension to Earth; they’re mean and bent on destruction. To battle these “Kaiju” the world puts aside their petty differences and comes together to build “Jaegers” to fight the beasts (don’t worry, definitions of these terms – and countries of origin – are spelled out onscreen for the uninitiated). It is quite extraordinary how the opening perfectly prepares us for this world, bearing in mind the considerable scientific and logical leaps required to make sense of it all. For instance, how the Jaegers are piloted by two individuals with compatible minds using a neural bridge known as “Drifting” to each control half of the huge machine. The voiceover is provided by Raleigh Becket (Charlie Hunnam), a Jaeger pilot and our hero who spouts dialogue for the rest of the movie like he’s still doing the voiceover or cutting a theatrical trailer. Everything he says has an emphasis of halting importance. From his melodramatic ramblings to his chiseled six-pack and tragic-death-in-the-family motivations, Raleigh is all cookie-cutter protagonist. After said tragedy involving his Jaeger co-pilot and brother, the program loses government funding as other bureaucratic solutions to the Kaiju dilemma are explored. 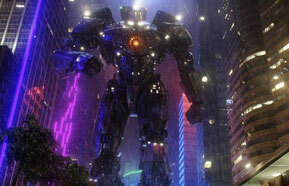 Only four of the giant robots remain and are moved to Hong Kong to operate in a clandestine “resistance” led by Marshal Stacker Pentecost (Idris Elba). Several years later, Stacker brings Raleigh back on duty to pilot his old Jaeger, eventually paired with delicate rookie Mako (Rinko Kikuchi) who has her own memories of Kaiju to overcome. The other pairs of pilots include a hero Australian father-son duo, the hardheaded son Chuck (Robert Kazinsky) providing friction for Raleigh’s re-introduction to the program. Think Iceman vs. Maverick from “Top Gun.” The other two teams are Russian and Japanese, defined by their looks and the look of their mechanized counterparts. They have almost no dialogue, so you can probably imagine their fates. There is also a pair of scientists – the nerdy Dr. Newton (Charlie Day) who gets giddy over all things Kaiju, and the even nerdier mathematician Gottlieb (Burn Gorman), who wears a bowtie and walks with a cane. Aside from some awkward comic relief that doesn’t always work, their function is to provide scientific data and pearls of wisdom as needed. The only real wildcard in the conglomerate of characters is the entertaining Hannibal Chow (Ron Pearlman), an eccentric black market dealer of monster remains. This isn’t to say the characters are lacking, quite the opposite in fact. They each exist to serve their purpose in the story and nothing more; in their simplicity they are perfect archetypes on which to build the sci-fi vision. And the vision of director Guillermo del Toro is the real star of the show. Details of the effects work are amazingly impressive, from floating digital displays to the scratches on the Jaegers and folds in the Kaiju skin, it all feels as real as it could. This is a well-thought-out world that has wear and feels lived in, not a computer processed reality. 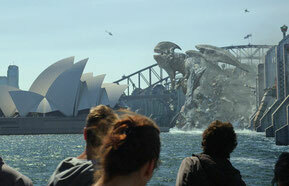 My only complaint on the action is that nearly every episode of Jaeger vs. Kaiju feels the same. It seems battles can only happen at night and in the rain – it may have been interesting to see a little more variety. del Toro’s grand imagination is on full display with a concept all about size and scope. At times complicated, “Pacific Rim” is never out of control of the director who deftly keeps things moving forward without getting too bogged down in the vast labyrinth of exposition required to fill in the gaps. An event movie that plays like a love letter to monster and event movies of the past, “Pacific Rim” taps into and expands on beloved genre tropes to stir a visceral response and spark imagination. In many ways it reminds us what makes sci-fi monster stories great. Giving all the Jaegers names like Gipsy Danger and naming each Kaiju with a menacing code word like Leatherback allows for inspired fanboy conversations about favorites and dream hypothetical battles. Expansive in scale, but lacking a unique enough identity to completely capitalize on its own mythology, “Pacific Rim” doesn’t quite have what it needs to sustain itself to the purposefully predictable end or leave any type of indelible mark outside of the moments it creates.